German Chancellor Angela Merkel told British Prime Minister David Cameron that reforming the European Union – in line with proposals he made last year – will take time and won’t be easy. 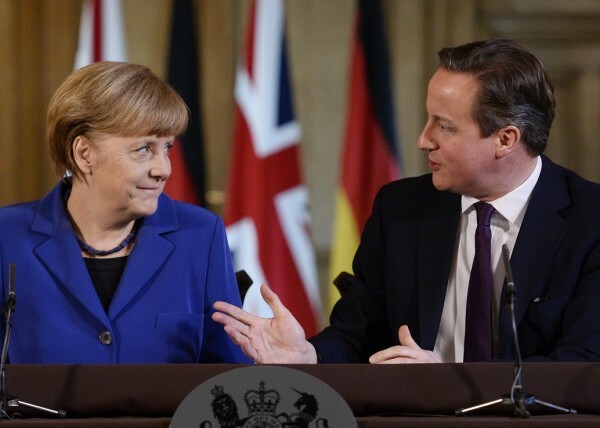 During their talks at 10 Downing Street on Thursday, Cameron said that both he and Merkel were interested to bring change to Europe. In a speech last year, Cameron argued for a referendum on continued involvement with the EU should he win re-election in 2015, a promise he first made during his election campaign in 2010. During her visit to London, Merkel said she did not agree with Cameron on fundamentally overhauling the EU’s mechanism, but agreed on some points that could be modified by working together. “It is not a piece of cake, it will be a lot of work; if we want Britain to remain in the European Union, which is what I want, if one also wants a competitive union that generates growth, one can find common solutions,” Merkel said in a press conference. Cameron wants to thoroughly re-examine and then renegotiate the UK’s relationship with the EU, and then let the British people “have their say”, with a “simple choice” between staying in on the new terms, or leaving. He said that if he managed to secure a new relationship that was in Britain’s interests, then he would campaign “heart and soul” for a ‘Yes’ vote in the referendum to stay in the EU. Merkel met with Queen Elizabeth II for afternoon tea following her talks with Cameron.